Hello, everybody. I have a lot of news and questions today. This is my first 80% rye bread and I have no idea if it looks like it should. Of course I've seen david's rye breads, hansjoakim's, mini oven's, Franko's, nicodvb's and others examples here on TFL, but I can't evaluate objective my own product: I can't tell if my bread is beautiful or so-so, if the crust expanded too much or not, if the crumb is too dense or it is just as it should be for this type of bread. I would have hoped to have more volume and the egdes of the bread to be more round and curved. The bottom is a bit concave. The internal temperature after baking was 209F (98C) - I overbaked it? I baked it 18-20 min with steam (was it too much?) and 30 min without steam. I cut the bread 16 hours after baking, cause I was too curious to see how it is inside. I left the bulk ferment 1 hour, shaped the dough in the air with my hands wet, as good as I could (a video for this would be gold! ), and then I dropped it in the floured banneton. The dough was wet, I had doubts if is OK to put it in banneton, but I did not know what to do with it. The more I kept it in my hands, wondering what to do with it, the more it started to stick, so, I dropped it in the banneton and I waited to see what happens. Well... it stucked a bit, and I think I should have put more flour in the banneton in the first place. Or is there another way to transfer it from wet hands in banneton, other than drop it directly? I agree, there are a lot of questions here. Maybe some of you can help me, I'd appreciate any advise from those with more experience. Given the fact I have never eaten a loaf with so much percent of rye (only 66%, I wrote about it in a previous post), I don't know how the taste is suppose to be. But for my taste, this bread is phenomenal, just like I imagined it would be like. Incredible sweet, earthy, verry little sour, with a strong flavor of rye. The sweetnes of rye was a revelation for me. I'll keep making rye breads, me and rye we are friends for life. First crumb shot was taken after 16 hours, the second crumb shot after 36 hours. I'll send this post to YeastSpotting. On my Romanian blog, Apa.Faina.Sare. 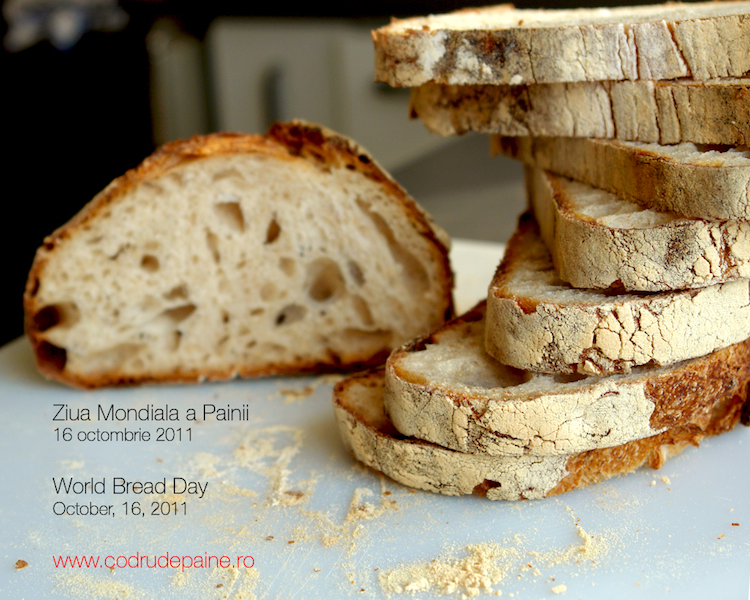 I launched an invitation, for World Bread Day in 16 october. I'd like to ask you to join me. 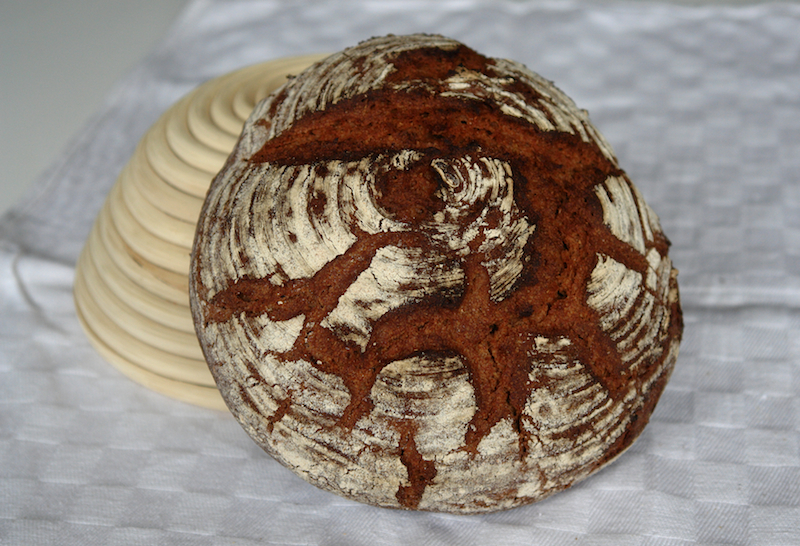 it is simple: I need a picture, or two, of a bread you made recently, your name (or nickname) and the name of the bread. That is all. I will collect all the photos and I will exhibit them on my blog, in 16 october, in a special post. I will be very happy if you'll respond to my invitation. My email is codruta at codrudepaine.ro, the last day for email is 15 october. 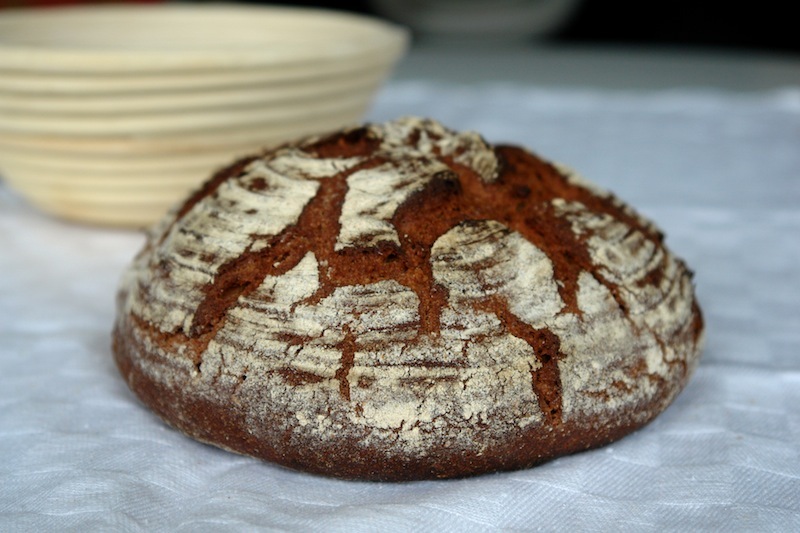 There're several artisan bakeries in London that sell rye breads with natural 'scoring' on the top, just like yours. And I can assure you your look as good as any of those made by professionals. Even better than some of them! Just beautiful, both inside and out. And the whatever-you-call-it bread :p in the poster for your Bread Day looks fabulous, too! What is it? Do we know the recipe already? Looks great to me. The crust colour is amazing. Nice work. Look forward to seeing many more photos of your rye creations. Very nice bake indeed. The crumb is surprisingly open for an 80% rye. And the crust looks like it has lots of caramel notes. I also like your invitation, I'll send some photos. @ Lumos: :) thank you for comparison with london bakeries. The bread from invitation poster is "Vermont sourdough with increased whole grains" from Hamelman's book. I baked it 2 month ago, but I never wrote about it, I did not have the time. I have all the photos and the formula (I increased the increased whole grains :), maybe I'll post it. @ Phil: I experimented the "stuck in the mud" feeeling. That's why I need tips and tricks, high percentage rye breads is a new territory for me. Thank you for your words. I'll wait your photos, thank you so much. Codruta, your bread came out gorgeous at the first try. It's really fantastic. I never dared to use a banneton with rye: far too risky, and I never take risks. I prefer either free-form loaves or I just flop the dough in the pullman pan. I wonder how you could get such wonderful crust, my bread always come out much paler. First let me say that this is a very very good looking high ratio rye bread for a first attempt. These aren't the easiest breads to make, particularly when it comes to handling them but you've done a nice job with this loaf of yours. Hamelman explains the DDT calculation in full on page 383 of 'Bread' but yes you're correct in thinking that room temperature should be one of the factors in the calculation. Other than leaving that # out you're going about it the right way. The easiest method I've found for working with rye paste is, as Phil mentions, having wet hands, and with using a plastic scraper to work the dough. Use the scraper to gather the edges of the paste towards the center mass and fold it over itself as many times as needed until you begin to notice a slight change in the feel of the dough. It's very subtle compared to what a wheat based will feel like when it develops, but the more you work with rye paste the easier it becomes to recognize it. High ratio rye paste ferments incredibly fast compared to a wheat based dough and bulk fermentation times are considerably less. Hamelman indicates 1/2 hour in his formula, but he also calls for a percentage of commercial yeast as well as the sourdough so perhaps somewhere in between the hour that you gave your dough and what he indicates might have been the sweet spot for BF in this dough. It depends a lot on how active your sour is as well, but it looks like you were very close to the mark. Final rise is generally shorter as well, usually around 60 minutes, so 9o minutes may have been a bit longer than needed and would account for the lack of volume you mention, however slight that appears to my eyes from your photo. Lots of flour in the banneton is needed and transferring the dough is a matter of gathering the paste into a ball (if using a round form) as best you can, then blotting off as much moisture from the dough surface as possible before placing it in the form. When I use a form for rye I'll turn it onto a parchment covered peel for the last 10-15 minutes before baking to let the paste pull away from the form. It doesn't always work perfectly and sometimes needs a little coaxing, but it seems to help. I hope this helps answers some of your questions and will be of use to you for your next rye bread...which I'm very much looking forward to seeing. Franko, before I decided to make this bread, I read your post 80% Sourdough Rye Bread- adapted from Jeffrey Hamelman's 'Bread'. It was very helpful and it gave me an idea of what I should or should not do. Initially, I planned to do a bulk fermenattion of 2 hours, but after 1h 20 min, I realised 2 hours will be way to much. Fortunatelly, the oven was hot from a burek I made before, so I was able to put the dough in the oven before it was too late. My brand new banneton remained with a lots of bits of dough inside, because I did not knew how much flour should I use. Well, I've learned a lot from this first try and I discovered that rye world is misterious, challenging and fullfilling. I can't wait to bake another rye bread. Thank you for your detailed comment, you answered to some of my question. I'll keep posting about my adventure with rye. I think your crust and crumb look beautiful! I would be very happy to take a bread like that out of my oven. 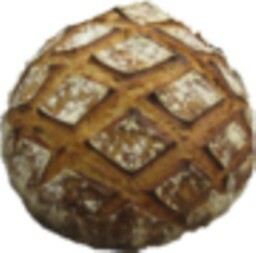 @nico: today is the third day of eating from this bread: I'm sold for life! 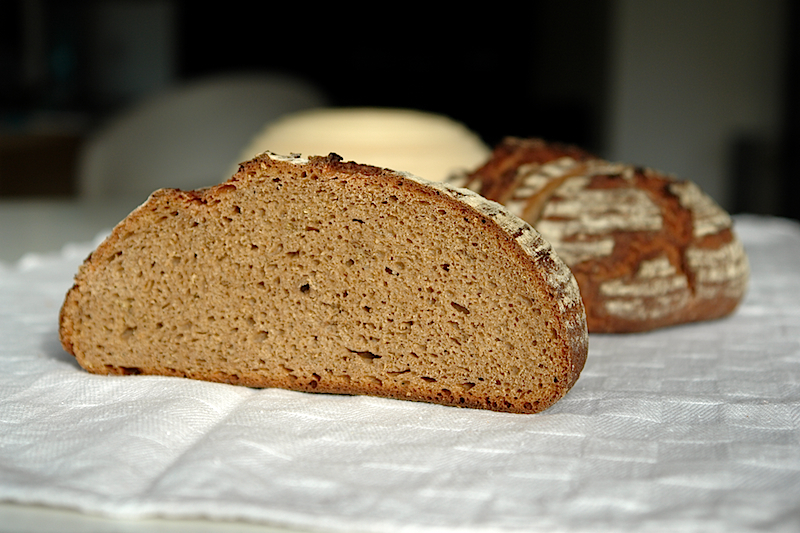 Rye is so sweet and delicious, for me is the revelation of the year! @David: you are too kind, David. You've been an inspiration for me, and I read all your posts about rye (in fact, I think I read all of your posts :). I found very useful and precious informations there, every time. Thank you. See? It's not so hard! Great looking loaf! I got one rising in a dutch oven ryet now. Love that rye! 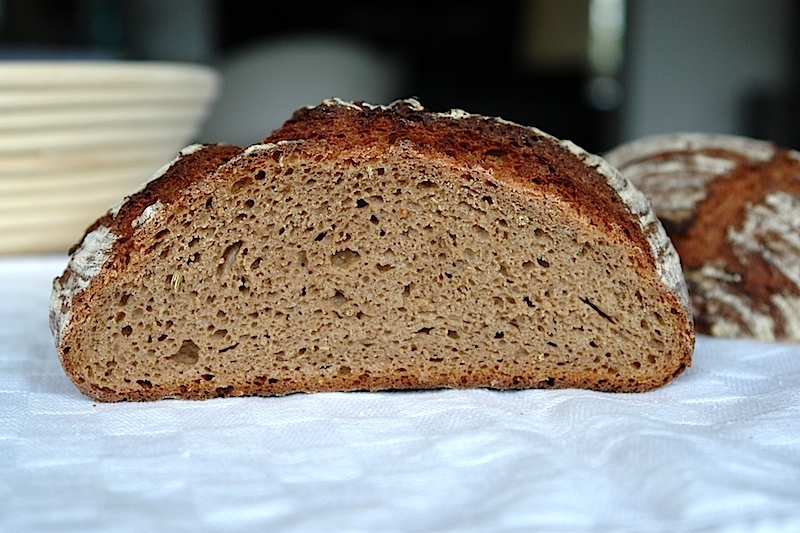 Your rye bread looks like a rye bread should. How much rye should a ryexpert sour if a rye sour could sour rye? ...all of it! 98°C is a little over, I shoot for 96° but if it needs more crust color, leave it in longer. Which means you could go for a higher beginning oven temperature. before turning it down. so if anyone misses Codruta's deadline of 15th, and has a blog, you can still post to the above! Question: should TFL have a thread under Artisan Breads for WBD just to talk about what we've done? If it were available in a bakery near me (I wish), I would rush to buy it. I also love the one you chose for your poster. You've baked a beautiful loaf; the color, natural seams on the crust and crumb look just wonderful. I am so glad you enjoy the flavor...I tried making an 80% rye with a scald a little while ago, and I am a big fan, too.